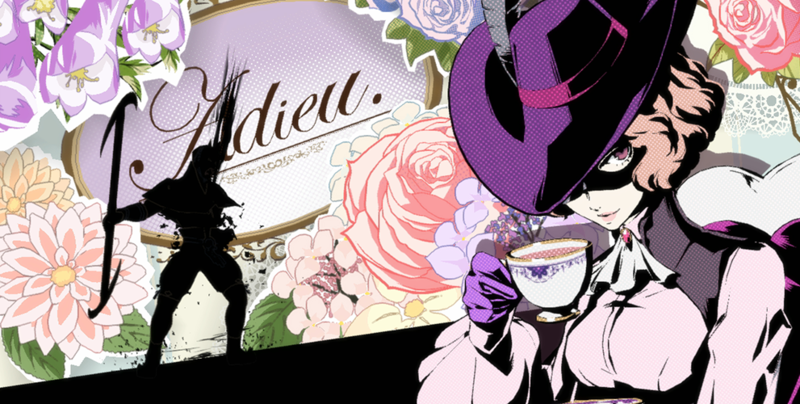 Warning: there’s some heavy spoilers of the mid-to-end game of Persona 5 here. If you don’t want to be spoiled, don’t read. 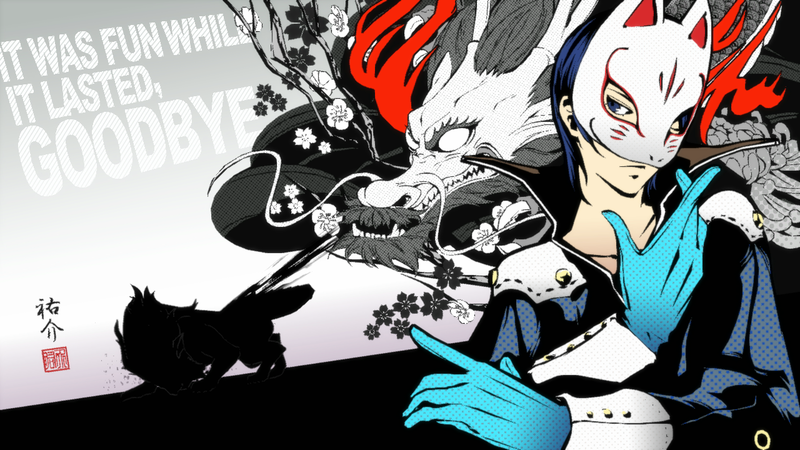 I finished Persona 5 a couple days ago, and thoroughly enjoyed it. 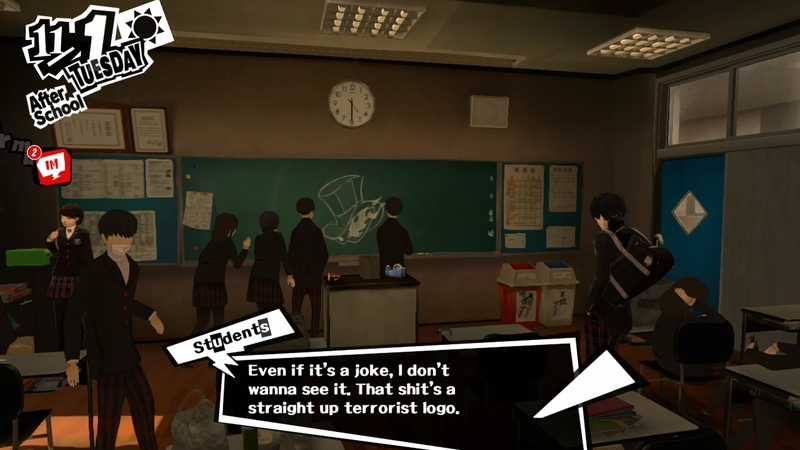 The games in the Persona series have a reputation of leaving something mental with you when you’re done, and I think that this one did. 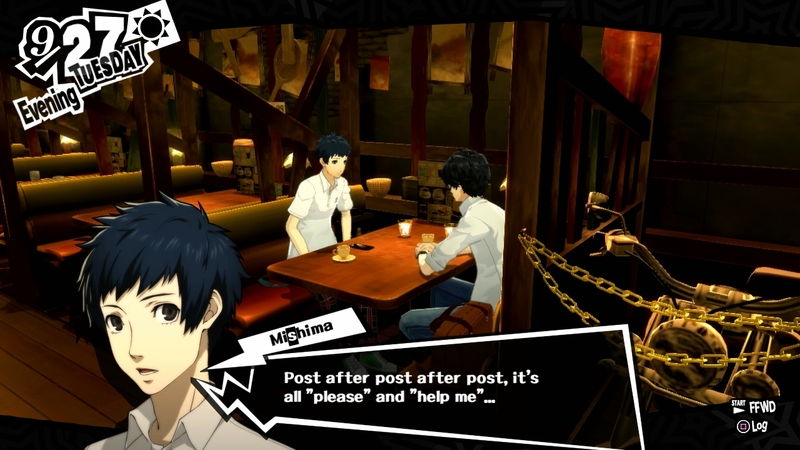 I’d played Persona 4 in the past, and it kind of introduced me to the format: there’s an ongoing plot, but also “Social Links” which take place in your downtime. How you choose to spend your off-hours is up to you, and if you want to advance relationships with different characters (both in-party and out) you can do that. 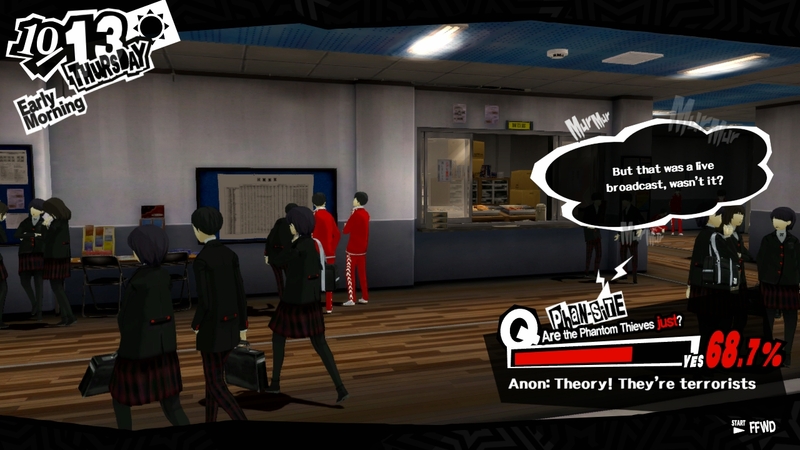 In Persona 5, Social Links are called “Confidants”, and I tended to like them a little more than in 4. Perhaps it was the art style, but the problems they had and how they chose to solve them felt a little more realistic, or at least a little more current. 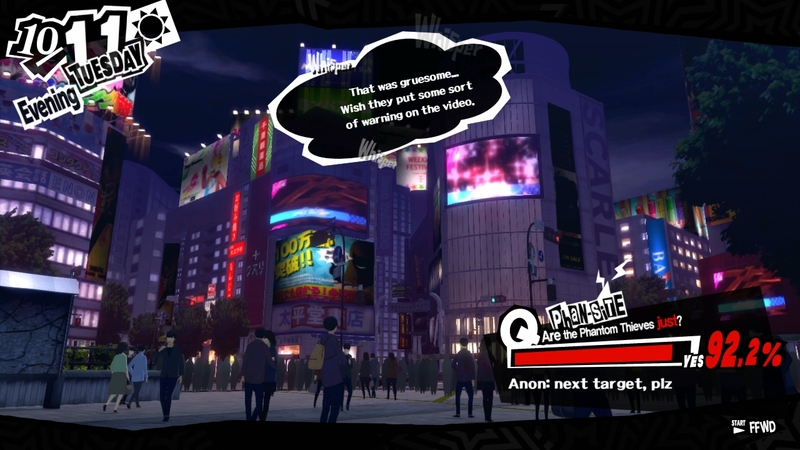 Persona 5 takes place in modern Tokyo. With this in mind, it’s interesting to look at it as pretty accurate snapshot of how society puts pressure on you as a person, especially if you’re still developing your idea of who you are. For many of the characters, they’re breaking free of what they think is “the way they need to be,” and I ended up identifying with that a lot. 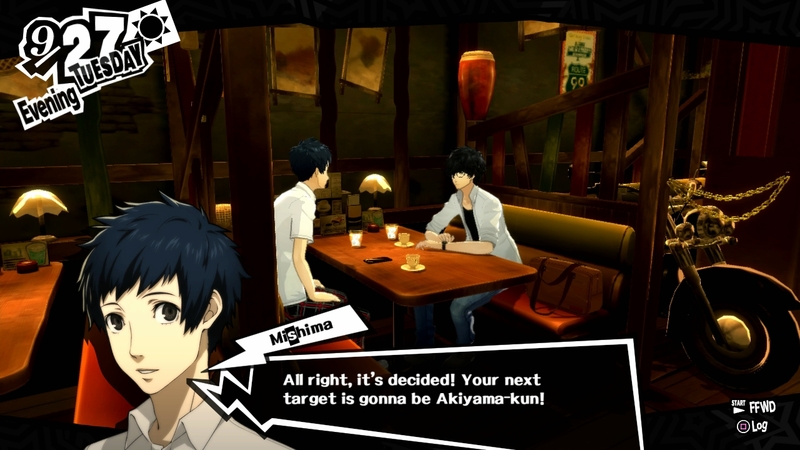 It first started to become noticeable around two-thirds into the game, when the Phantom Thieves go from being in control of their situation to… not. 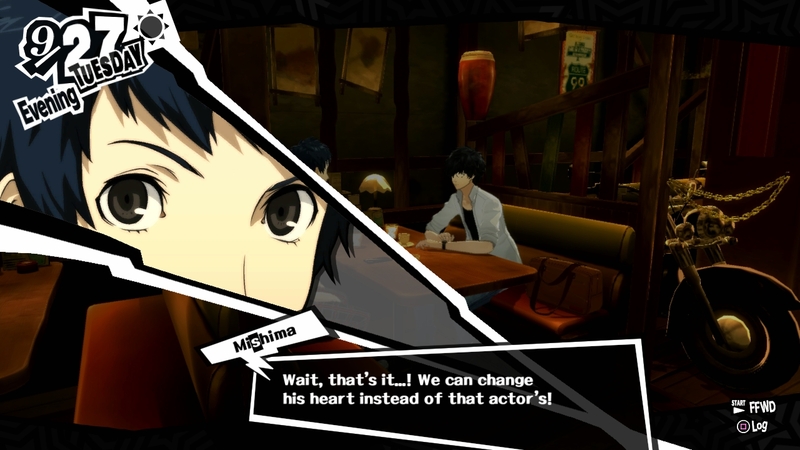 For the uninitiated, the player character and their party in the game are given the power to “steal hearts” and change people who they view as corrupt. 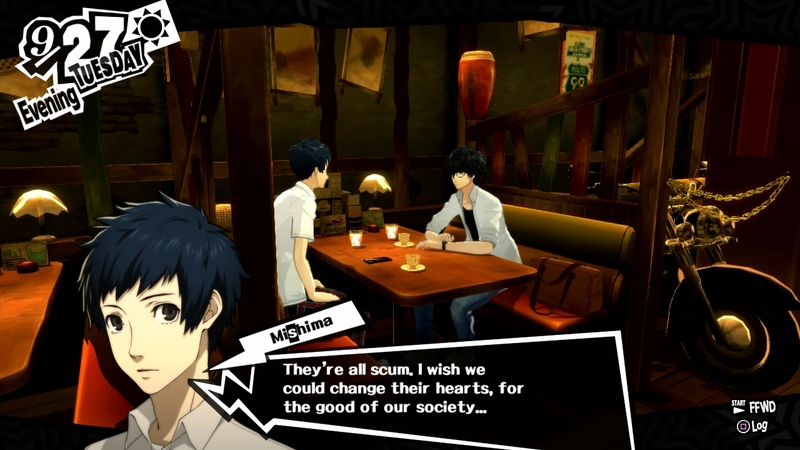 Every level in the game has the ultimate goal of “changing someone’s heart.” Usually, this is done with the best intentions: to chase “their justice” for people who have been abused, taken advantage of, or otherwise can’t stand up for themselves. At some point, our party becomes a bit cocky. Things have been going too well at this point, and some members feel a bit invincible. They’ve been given a power to decide how society can change, and their choices about their targets start to shift from necessity to vengeance or spite. They decide — with some hesitation and outside pressure — that they’ll be taking on someone much bigger and more dangerous than usual. At the end of the section, when that target would normally have a “change of heart”, they end up dead instead. This is a turning point in the game, because leading up to this the Phantom Thieves were not only pretty good at their jobs, but they also had the mass support of the public. What the public sees as murder causes support to plummet, as social media messages you see in loading screens turn from encouraging to attacking. The mob turns bloodthirsty, first to see similar results with other people they view as fair targets, and then towards you. Your party members are shaken, and they lose the confidence they once had: were their actions ever right? Were people going to find and hurt them? Were they in over their heads? These kind of messages felt familiar: I’d seen them before from real people who were looking to justify their anger at other areas of their lives by lashing out at someone they felt was fair game. While they thought they were on the right side of the issue, the circumstances changed and introduced nuance — but people don’t have time for that. The game capturing a fairly recent issue — how people wield power online that they may not have had before — mirrored something I’ve found myself scared of. Am I one wrong tweet away from losing everything I’ve built for myself? Would people who knew the “real me” give me the benefit of the doubt if that mistake were to happen? Does this anxiety keep me from having the courage to stand up for my principles in general? Where this kind of wheels around to is the Confidants. The core message behind a lot of the Confidant arcs in the game is that the characters affected by problems are learning to fix them on their own terms. Often, they’re breaking previous perceptions of what they think is their place in life, or what they think is determined by outside forces. Perhaps that’s what resonated with me about the game so much; being the supporter in the game mirrors my desire to be supported more in real life. Despite building great friendships and a career through the Internet, I struggle in some areas where the loneliness of not having that solid, stable group of local friends seeps in. It’s cheesy, but it’s kind of like Cheers: we want people who seek our company and make us feel valued. It makes me remember reading an account of finishing Persona 4 by someone who said that they felt an immense sadness after because they were leaving behind what they viewed as an ideal high school experience: adventure, romance, and a deep friendship. When they departed Inaba, they were also leaving behind what they wished their life was like, or had been like, and reality was depressing. While I wouldn’t go that drastic in my case, I could understand where they were coming from. 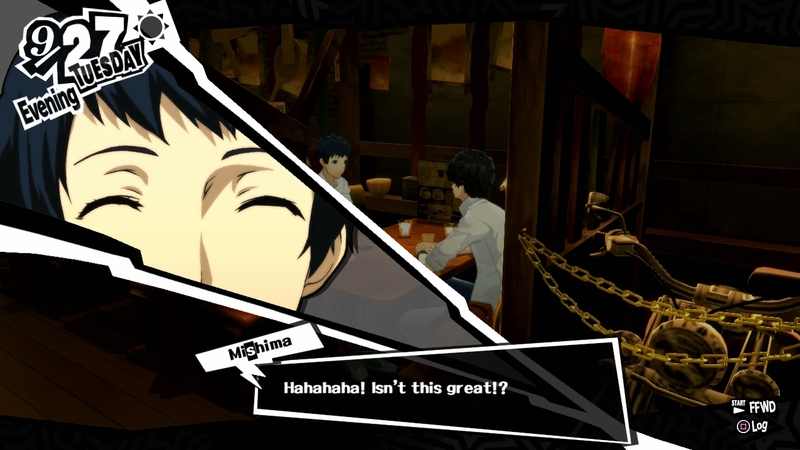 The escapism of video games rewards you for giving yourself to the experience, and depression can intensify the holes that the positive moments in the game fill. But what about what you take away from the game separately? Instead of dwelling what you didn’t have compared to a fantasy, you could find motivation in Confidants pulling themselves out of negative situations, right? The thing is, with TV, anime, manga or comics I’m always hesitant to give myself entirely to the inspiration they give me. In some ways, it feels almost naive; those stories and their universes are in full control of their creators, and if a character works to succeed, and the creator has that as part of their plan, they will. Real life is not like that, and to say that I come away from reading a manga or playing a game with a new outlook on life seems shortsighted. It seems overly idealistic — seeing a protagonist triumph after all their hard work is a planned event, and not always something you can replicate if you were to take the same steps. While that 1:1 result isn’t always the point, there’s a sense of catharsis that we get from when characters we care about triumph. I know I sound cynical, but I’m trying to find a balance. Saying “that’s not realistic” denies yourself the possibility of positive feelings from something that speaks to you. However, throwing yourself completely into an inspiration opens yourself up to massive disappointment when the circumstances of reality set in. That in itself is reality: that disappointment is the risk that you shoulder when you start. 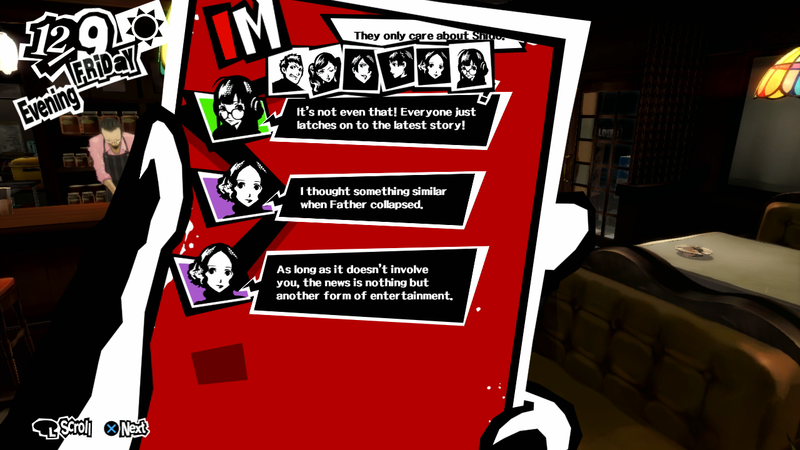 The optimism of the Confidants kind of clashed with the game’s final conflict: despite your intentions to change society for the better, that same society chooses comfort and stagnation, which in turn influences a malevolent god to destroy it as a whole. I’m less focusing on that “malevolent god” part, and more just thinking about how the end “reality” of the game clashes with a lot of its messaging, almost like it should. Walking around the final dungeon and seeing hanging figures trapped in cages still kind of pinged me a little bit. Have I just given up at any kind of improvement? Have I not given enough time, effort and consistency needed to make a better place for myself? Am I too comfortable? Or just being too hard on myself with something that takes time? 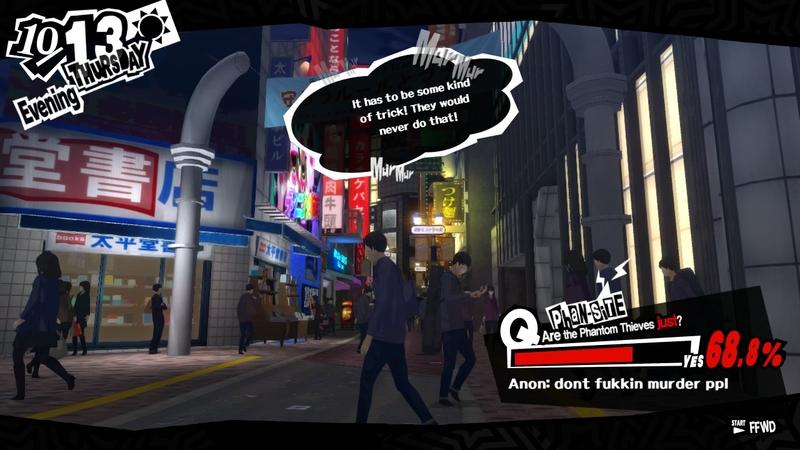 The game doesn’t end with society fixed, and people aren’t all of a sudden able to turn themselves around after the Big Bad’s defeat. We’re left with a sense of uncertainty: despite doing what the game tells us as a good thing, did we really enable people to make those positive changes? I think the shades of grey are appropriate, since we can’t really know — all we’ve really done is made sure that everyone has the agency to approach positive change for themselves. Whether that motivation comes from anger, frustration, impatience, or inspiration, it still remains up to us whether we start the journey to change. 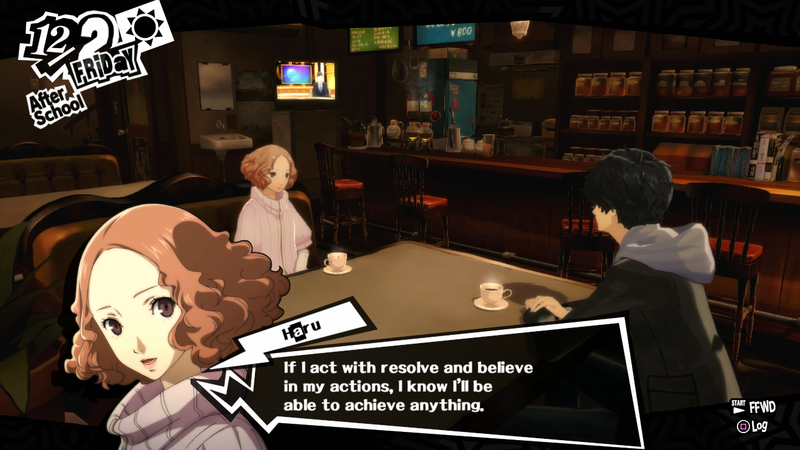 Perhaps that’s what’s messing with my head a bit; Persona 5 left me frustrated with my inability — or hesitance — to act. When I talk about this with people, the simple challenge to what I’ve mentioned here is asking me whether I’d be comfortable with risking nothing, but doing nothing with my life as a result. Perhaps it’s that external definition: I still don’t know what “doing something with my life” looks like. I am still chasing a base level of stability from which to build on, and defining what I want badly enough to chase, despite the possibility of failure. 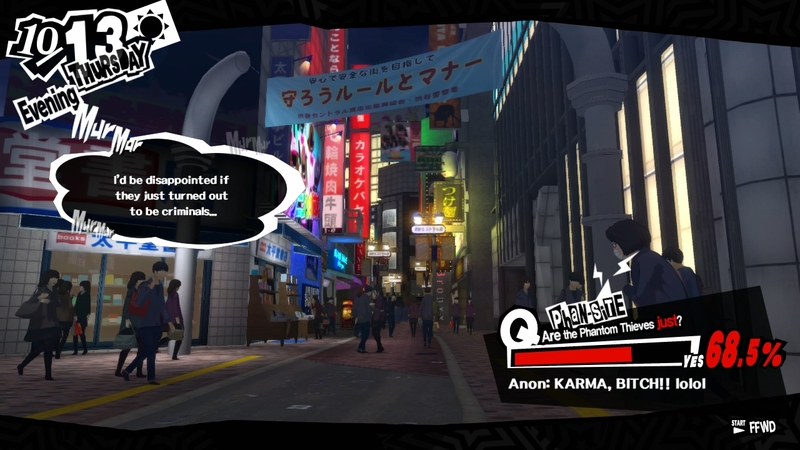 Despite that lack of clarity, Persona 5 was a wholly positive experience for me. It caused me to question both myself and how vulnerable I’m allowing myself to be when I “let things in”; the desire to express that vulnerability greatly influenced this piece. Games like this don’t fix you; they just kind of cause small connections to form, even if you don’t act on them. While the core thing to take away here is that you can change on your own terms, there are still steps on steps on steps to get there. Having the patience the even approach those steps is a skill on its own, but the fight for yourself is most likely worth it.